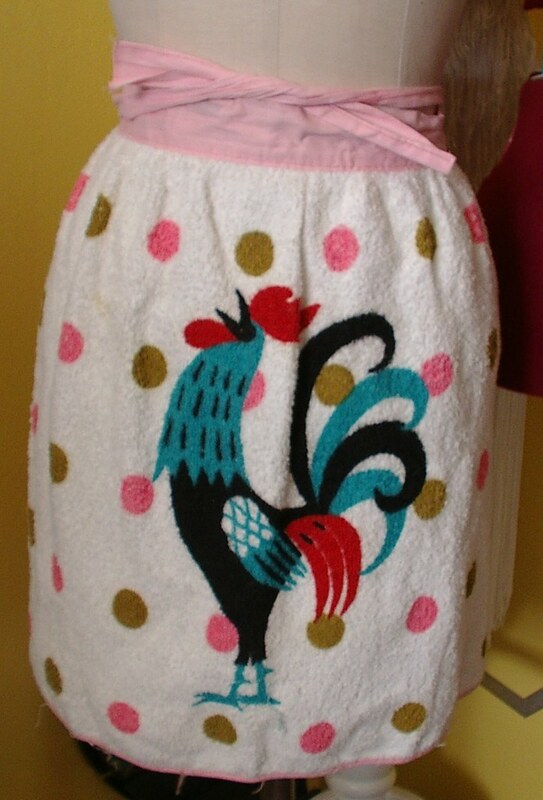 I collect roosters so when thew girls and I saw this apron at the thrift store ($0.50) who could pass it up. It is made from terry towel material. We use it when washing the dishes as it is more absorbent than other aprons. I really love the graphic image on this mixed with the polka dots. It is one that was originally purchased in a store and not homemade. As you can see the ties are not really long enough for an adult toe wear in the front but the girls do. If you look close you can tell the bottom of the apron has some issues do to being used a lot by the kids. I love your aprons. I have quite a collection myself. They get me in the homemaking ( cleaning,washing dishes,ect) mood. I love your aprons. They can sure put a woman in the mood for housework. I have quite a collection myself.